Make no bones about it, Robin Trower is an axeman’s axeman. A member of Procol Harum from 1967 until going solo in 1971, he modeled his own band on the power-trio blueprint of Cream and Taste, and, of course, the Jimi Hendrix Experience. His atmospheric, effects-laden Stratocaster brought inevitable initial comparisons with Hendrix, but he quickly made his own mark. His second album, ‘Bridge Of Sighs’ reached the Top 10 in the US and has Influenced a generation of musicians. 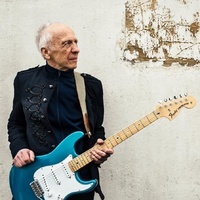 Robin Trower live is an experience not to be missed. This show will feature a trio, Robin’s favorite line-up, with Richard Watts on Bass and vocals, and Chris Taggart on drums. Whether you play guitar, or just enjoy a brilliant soulful player, come out and see the show. You will walk away smiling.